Welcome to Ancient Greece! Santorini puts you in the position of workers trying to build towers and beat each other to the top. What better way to prove yourself to the Gods, right? Your opponent, however, will try to out-build you, blocking your path. To make matters more interesting, each team will be blessed by one of Greece’s deities, giving them special abilities. Are you ready to show your devotion and outwit the other person? Will you stand atop the finest towers of the Aegean and claim victory to the Gods? Santorini has existed for 30 years, the creation of mathematician and educator, Dr. Gordon Hamilton. Originally an abstract strategy game, a simple version appeared in 2004 with a minimalist appearance. Only recently, however, Roxley Game Laboratory used crowd-funding to update the game’s appearance and theme. 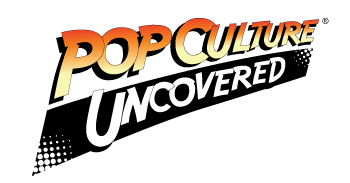 This new version of the game hit shelves this January and has grown in popularity. The core game itself reminds me of classic strategy games like Checkers or Go, which makes sense given its origins. The rules are easy to learn, fitting on a single side of one page; it’s the strategy, however, that make take more time. A player moves a worker each turn and builds a level of a tower; if any worker reaches the top of a third level, the player wins. It sounds simple, but given you must move and build each turn, are restricted in how you do either, and can be blocked by your opponent… there’s a lot of tactical thinking involved. Add in dozens of unique God cards that give players special abilities (and change each session), and you have a lot of replayability. The re-imagining added the theme of Ancient Greece and the island the game was named after. Originally nothing more than geometric pieces on a game board, now you have plastic workers and tower pieces set on a floating island. Although nothing spectacular, the figures are still aesthetically pleasing while maintaining the simple feel to the game. White buildings and blue tops also reflect the architecture of the real island of Santorini, adding that Mediterranean feel. The best artwork, however, is in the 40 cards for the Gods used in the advanced version of the game. Although done in a more cartoonish fashion, they all beautiful and can make you smile. 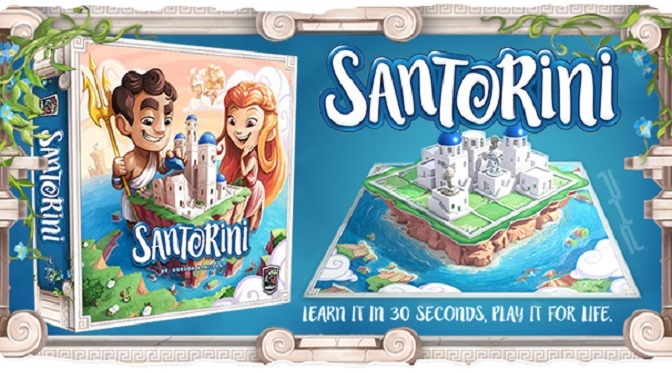 The nice thing about Santorini is, as a simple strategy game at its heart, this is ideal for families and children. Listed for ages 8 and up, elementary school children will have just as much fun as Checkers or Othello. In fact, when there are four players it becomes a team versus team game, allowing adults to assist kids as they learn the game. Add in the quick pace (we played two basic games in probably 20 minutes), and this is a fantastic choice for most households. I give Santorini an enjoyable 4.5 out of 5 Golden Fleeces. Santorini is on shelves now, as is its first expansion, “Golden Fleece.” 2-4 players, 20 minutes. Right?! I absolutely love this little game. It’s such a nice reprise when I’ve been playing so many games with so many rules; my ten year old son always wants me to play every day with him. And just this evening he beat me! Thank you for your pics and for the post! I truly loved it!